Extend the enjoyment of your outdoor space with this 4-season solarium. The Add-a-Room Solarium is constructed from aluminum and features a reinforced roof, two sliding doors and 5-position wind panels. Forget worrying about exposure to rain, snow or harmful UV rays, with this all season solarium enjoying barbeques, parties and outdoor spa days has never been easier. The Feria Patio Cover provides flexible options for your specific patio needs including adjustability of the support pole distance and back wall height. The simple self-assembly and the Click N Lock roofing panel installation creates a watertight seal. The solar grey , virtually unbreakable polycarbonate panels offer protection from UV rays, water, snow, and hail while bringing in sunlight to your patio and home. This cover can handle a snow load of 37 lbs. per square foot. 14 ft. Sq. 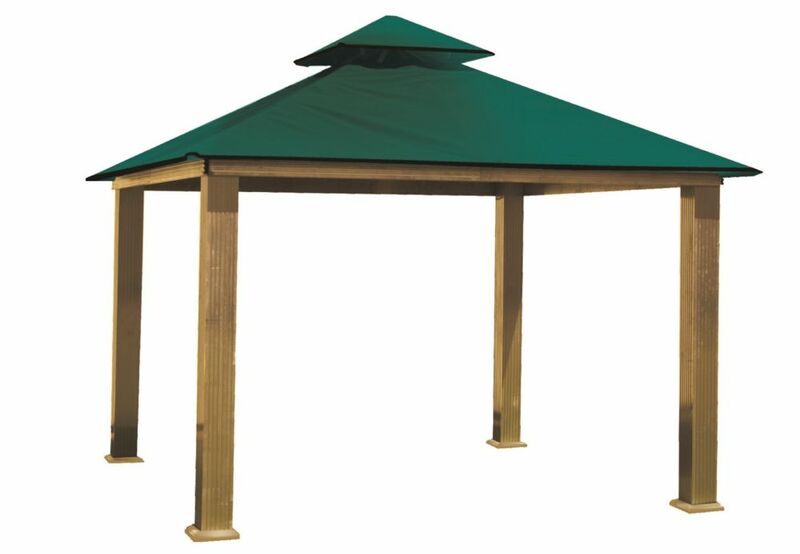 Gazebo -Green The ACACIA Gazebo program offers the enthusiast the ability to extend their covered living area. Our rust free Structural Extruded aluminum frame will last a lifetime. The Electrostatic finish makes the frame even more durable and attractive. The electrostatic finish actually sends an electric charge through the paint and the frame to help cause a chemical (ionic) bond, much stronger that simple powder coating commonly found in imported versions. From our quick assembly sculpted heavy-duty legs that can support over 1000 lbs. each to our unique frame design. We use Sun-DURA branded solution dyed polyester fabrics from Glen Raven Inc. Our factory precision laser cuts each of the canopy tops for the best fit. With 19 total colours available, we are sure that there is a colour to match your exterior and your needs. With a simple design, the canopy can be easily removed during winter months, extremely windy conditions, or for cleaning.